Prosaic is one of those words that I come upon infrequently and in such context that I never bothered to look it up in the dictionary. So I never had a clear understanding of its meaning, only gleaned it from the situations where I found it used. I’ve recently discovered that I had the wrong idea of this word all along. In gleaning a meaning, I give weight to the way that the word sounds to me and prosaic has a pleasant little lilt to it. But it means the same as mundane – which sounds as it is intended, stodgy and dull. In enjoying the way that prosaic sounded, I was uplifting it to be similar in meaning to poetic instead of its opposite. Being a word in the periphery of my awareness, I never thought about the origin; its direct relationship to the word prose. A word which encompasses all of my efforts on this blog, a cousin of my chosen word essay. 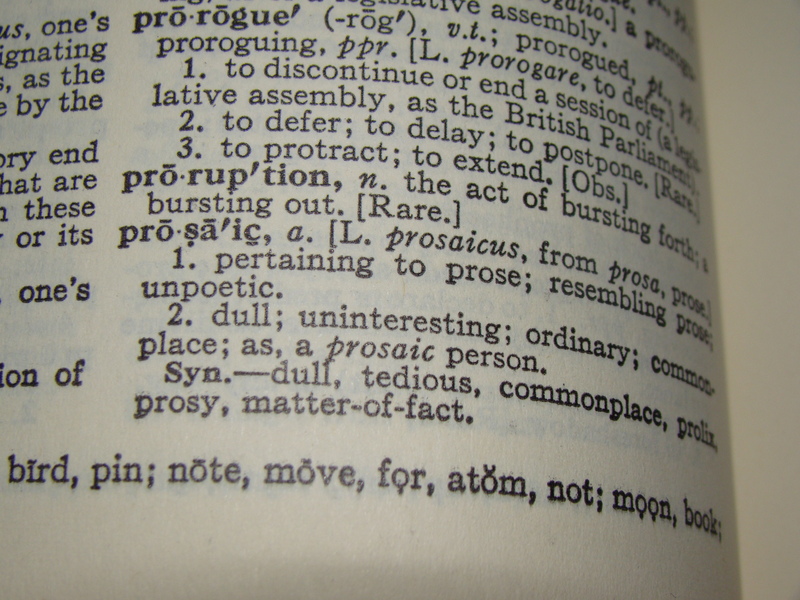 Around 1746 the dictionary says prosaic’s meaning was “having the character of prose (in contrast to the feeling of poetry)”. This was almost 100 years after the word came into being. It seems understandable to me that we become familiar with a narrow selection of words and then use what is most familiar. In our constant search for meaning and value, we cling to the things that are comfortable and familiar. Regardless of how prosaic they may be. Thanks for pointing this out, I think I shared your original meaning. I’ve been paying more attention to words and their meaning as I write more. I want to avoid misuse or sending the wrong meaning. It actually caused me to change my approach on the recent math post. As I think about it more, I wonder if the authors who used prosaic also didn’t have a clear understanding of the definition. Of course meanings also shift. There are words that now mean almost the opposite of what they originally meant. You’re right. My wife will often look words up in an old dictionary for just that reason. How do we ever manage to communicate with each other considering these odds? Thankfully we do more often than not.